Click on any of the blue squares to show a product. Double-click on any displayed product to hide it behind a blue square again. 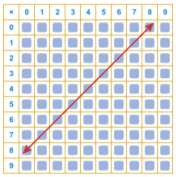 What is special about all of the numbers along the upper-left to lower-right diagonal, from 0 × 0 to 9 × 9? Reveal all the products along the diagonal from 0 × 8 up to 8 × 0. What do you notice about the numbers that lie along this diagonal? What other patterns do you notice?